As I've noted before, I started this blog primarily to share information about my annual holiday mixes and the various tracks I've selected for them. It never occurred to me to review new holiday music releases in this space, nor do I feel especially qualified to do so. Over the years, however, I've allowed the scope of the blog to expand, and, as a consequence, I now receive upwards of several dozen messages each season from artists, agents and record companies looking to promote various new holiday releases here. I've got no problem with that. I enjoy the exposure I'm getting to different styles of new music, and it's easy enough to listen to what comes in. But make no promises about promoting any of the material that's submitted. That's just not what this blog is about. If it's new stuff you're looking for, there are several excellent holiday music blogs that focus primarily on new releases. The best of these, for my money, is Stubby's House of Christmas, but several of the other blogs in my list of "Favorite Holiday Music Sites" (they're listed to the right) are also terrific at highlighting new music. 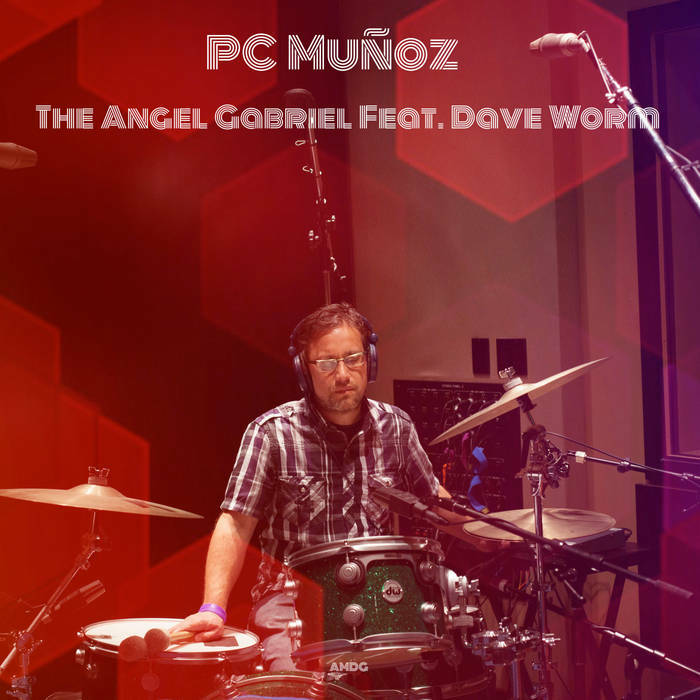 San Francisco artist PC Munoz is best known for his work as a percussionist and beatmaker, and he's worked with an impressive and diverse array of artists including Jackson Browne and longtime Prince collaborator Dr. Fink. He is also a talented and innovative songwriter and producer whose work spans a variety of genres and styles. He recently released a remixed version of a track he recorded last season called "The Angel Gabriel," based on the beautiful Basque folk carol more commonly known as "Gabriel's Message." the lyrics tell the story of Gabriel's descent from Heaven to tell Mary of her selection to bear the child of God. It's a beautiful song, typically performed in an ethereal-sounding arrangement that dates back to the late 19th century. Munoz, not surprisingly, offers a different take. 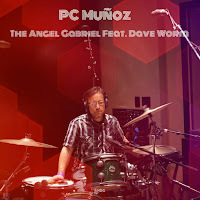 Framed by the sung vocals of vocalist Dave Worm, Munoz's version features funk beats, hurdy-gurdy, xylophone, and Gregorian Chant -- yet as incongruous as these elements may sound at first, the result manages to bring things current without sacrificing even a smidgen of the song's classic beauty. It's difficult to call this six-song collection a new release, as all but one of the tracks are at least a year old. And next year it'll be difficult to call it a six-song collection. You see, what makes this a "living Christmas record" is that once each year, a new track is added. Interesting notion, no? 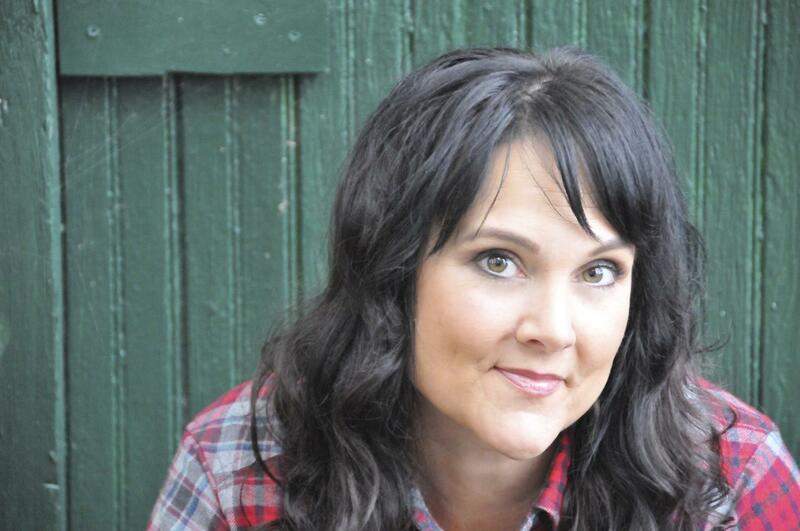 Well, interesting or not, Miranda Dodson, a singer-songwriter from Austin,Texas, has the chops to pull it off. The current version includes a mix of original tunes and familiar classics that hold together well. I wonder what next year will bring? Seattle singer-songwriter Kristin Chambers attracted notice with her 2014 debut album Everything Woman, and she's doing it again with her sophomore release, Snow Globe. A mix of classic carols and original compositions, it's the latter group that works best. The opening track, "Christmas Eve," is a soothing and peaceful number with the air of a children's lullaby. "It's Not Christmas (Without You)" is a bluesy number lamenting the absence of a loved one, while "A Magical Guy" features Casey MacGill singing the part of Santa Claus. My favorite is Chambers' "Frozen Heart," a beautiful and optimistic song that showcases her vocal talents. This one's a nice collection that's sure to appeal to listeners of all types. Today is Black Friday, and I see from the news that there have already been injuries and arrests at several WalMart locations. I have no intention of shopping today -- in fact, I may not leave the house. Plenty of leftover turkey here, and besides, it's cold out there! Robby the Elf bills himself as "the world's first musician to exclusively record Christmas rap music," in a style he calls "Christmas Crunk." What is it exactly? Well, Robby describes Christmas Crunk as "like Eminem spent the holidays at Jazzy Jeff's. Sometimes it's funny, sometimes it's serious, but it's always hip hop and it's always Christmas." 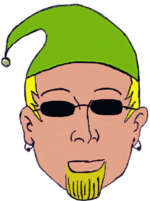 Originally from Upstate South Carolina, Robby the Elf has been recording Christmas Crunk for over a decade now in an effort to spread a positive message. “I realize that the holidays are not always happy times,” he explains. “It brings sadness as well. I merely desire to help those less fortunate. That's what Christ did and Saint Nicholas also. I don't expect to be compared to those two, but I want to do my part. If I can bring a smile to a sick child's face, or ease sorrow in someone elderly, then I consider that a success.” Love him or hate him, Robby the Elf’s mission is also to spread awareness about the repression of elves, showing people that elves are an important part of maintaining a positive holiday spirit. “My goal is to have everyone to hear my music so that someday, each Christmas Eve, every child will also leave, a cookie for an elf.” He's certainly prolific. You can hear some of his creations on his website, Facebook page or via CD Baby. My grandmother and godmother ran a very successful New Hampshire summer camp for girls when I was growing up, and a number of minor celebrities either sent their children there or went there themselves as children. One such former camper was Cindy Bullens, a singer-songwriter best known in the late 1970s as a backup singer for Elton John. She also contributed three tracks to the soundtrack album for the hit movie Grease. Bullens ultimately got a record deal of her own, and her debut album Desire Wire was released in 1978. The album got good reviews but sold relatively poorly. Her second album met a similar fate. Yet Bullens has kept plugging along these past 35 years, producing consistently strong records and playing clubs and other small venues in front of modest-sized groups of loyal fans. The last time I heard her play was during the summer of 2007, when she played before a few dozen people on the small island where my family's had a summer home going back five generations. Bullens sang after an island-wide community supper on the second floor of the island's common "casino." She started sometime around 8 pm and the sunset was breathtaking through the uneven panes of the century-old glass windows. It was the last night my Dad and I were on the island together, and while he was in the early stages of Alzheimer's disease at the time, he boldly approached Cindy after the show and told her I'd been a fan since high school not only because of the camp connection but because I genuinely liked her music. "I do, too," he added. It was the first time I'd known him to willingly listen to rock and roll. I was thrilled that he stayed for the whole show, and thrilled, too, that she closed with a tune by Bruce Springsteen. It was a wonderful, sublime evening. 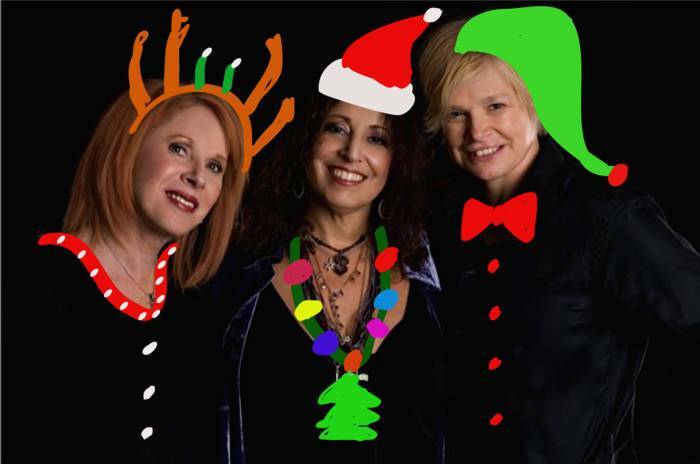 Several years ago, Bullens teamed up with singer-songwriters Wendy Waldman and Deborah Holland to form a band called The Refugees, and the three women record and tour together pretty regularly between their projects as solo artists. I don't know much about Holland, but I've liked Waldman's work since her 1976 single "Living Is Good," which, I'm fortunate to say, is the strongest antidepressant I've ever needed. Last Fall, The Refugees recorded an original tune called "This Christmas," which they made available as a free holiday gift for their fans. This year, they've posted a new version, which you can hear and/or download from HERE at no cost. According to Bullens, "This is a joyous, rockin' new re-mix that is bound to make you smile -- whatever your bent! (Think "Jingle Bell Rock" or "Rockin' Around The Christmas Tree"). Just plain rockabilly fun! As my two Jewish co-horts in The Refugees would say--ENJOY!" Incidentally, Bullens came out publicly in 2012 as transgender and now goes by the name Cidny Bullens. I had a call from my brother one Friday evening this past May. It was around 7 p.m. in Los Angeles, which made it 10:00 back in North Yarmouth, Maine, where he lives with his wonderful wife and their beautiful daughter, who'd just turned 13. "You'll never guess what I'm doing," he said. There was music in the background -- slightly distorted, somewhat muffled, and loud -- like the sound of a rock show from outside the arena. "Wait," he said. "Let me get closer." The song sounded vaguely familiar until, in an instant, it all became clear: " . . . to be a rock and not to roll . . . ." He was waiting for his daughter and her friends so he could take them home after their first school dance, which ended with Led Zeppelin's classic "Stairway to Heaven." I thought for a moment about the long, twisted road I've been on for the last 35 years, and the unbelievable changes the world's been through since my first dance. Yet now, as then, a group of awkward young teenagers were nervously getting together in a school gymnasium to the sounds of "Stairway to Heaven." What's this got to do with holiday music? Not too much, I guess, except to underscore that few things can evoke powerful memories so effectively as music, which is probably why holiday songs have the power they do. For example, what led me to start thinking about school dances was a quick reference to Led Zeppelin in one of my very favorite holiday music blogs, Stubby's House of Christmas. I can't say I know a whole lot about Stubby, other than what I've read in the blog. He reportedly lives in Greenville, NC and loves cats. He also does an incredible job each year of discovering and writing about an impressive array of newly released holiday music of nearly every type and style. Stubby's introduced me to a number of my very favorite seasonal releases recently, including "Sha La Da La La (Christmas Time)," by the Sha La Das, and the wonderful holiday album released in 2013 by The Bowmans, titled Make Sure the Snow Falls. 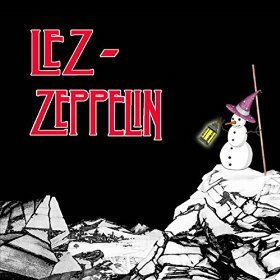 Well, it's not even Thanksgiving yet and Stubby's already outdone himself this year with a bevy of great recommendations, including a great new holiday single called "Mystic Snowman," which is a mash-up of "Stairway To Heaven," "Greensleeves," "Carol of the Bells" and "Frosty The Snow Man" -- if you can believe that. Looking quickly at the cover, I was surprised to see it was from Led Zeppelin . . . and then I looked at the name more closely. Yup, it's Lez Zeppelin, an all-female Led Zeppelin tribute band based in New York City. The band is currently wrapping up a Fall tour, and you can find information about that and all kinds of other things at their website. And you can download their beautiful holiday tune for only 99 cents on amazon.com HERE. And while it isn't strictly speaking a holiday song as such, the preceding narrative gives me a good excuse to close today's post with one of the most amazing cover versions of another act's song I've ever seen -- Heart's version of Led Zeppelin's iconic "Stairway to Heaven." This is from the 2012 Kennedy Center Honors program, which was aired on television two days after Christmas that year. The remaining members of Led Zeppelin are in the hall with President and Mrs. Obama and the other honorees that year, and the resulting performance is too magical to describe. Watch it! We're Back for the 2015 Holiday Season! Season's Greetings, friends! It hardly seems possible, but another holiday season is nearly upon us. That means it's time to slowly shake off the cobwebs and prepare for another round of fun and frivolity. I started this blog four years ago as a means of sharing additional information about the contents of my annual holiday mix CDs. I've been putting these things together for over a dozen years now to share with family and friends each Christmas in celebration of the season. You can access and read more about my various CDs on my Holiday Music Website. This year's CD is pretty much completed, and while I'll probably tinker around with it a little more over the next week or so, I'm planning to post it on the website sometime around 12 noon on Thanksgiving Day. That will give you something to listen to as you return from the mall. I hope your year has been a pleasant one and that you're looking forward to an especially memorable holiday season. With the unspeakable horror of last week's terrorist attacks still echoing in and around Paris and the numerous other atrocities taking place throughout our weary world, we could all use a little Christmas cheer right about now. 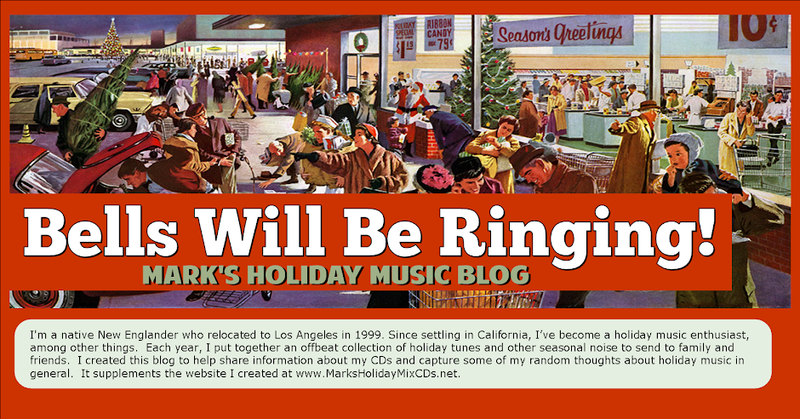 Welcome to our fifth holiday season at the Bells Will Be Ringing holiday music blog!